The Rebel Sweetheart. 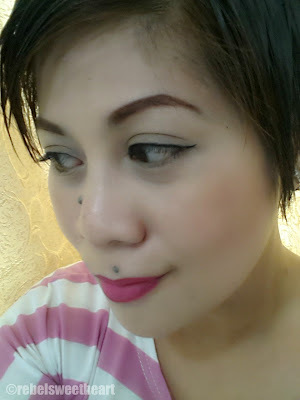 : Spotlight | Sleek MakeUp Flick It Eyeliner. I've tried quite a number of products from Sleek MakeUp and my previous experience/s with the brand have always been good. This week, I road-tested one of the newer products - the Sleek MakeUp Flick It Eyeliner, and I must say, the brand has impressed me yet again. Launched early this year, Sleek MakeUp's Flick It is a liquid eyeliner that looks a lot like a colored pen at first glance. Haha! Not a colored pen, haha. It has a very fine, precise felt tip point that allows for easy control and smooth application. If you're a newbie at wearing makeup and isn't sharp as a tack when it comes to eyeliners, then this pen-type product is a good way to start. The Flick It Eyeliner comes in three shades - Dazzling Black, Purple Aura, and Royal Blue. What I have here is the Royal Blue, which is a very wearable shade. I was actually quite hesitant to use this at first, thinking that blue would look funny on me (I've always had this stigma that blue eyeshadow/ eye makeup does not suit me). Sleek MakeUp, however, proved me wrong. Flick It in Royal Blue. Another impressive thing about this product is its color payoff. This Royal Blue shade is so pigmented that a single stroke would be enough to produce a gorgeous semi-matte finish. One stroke on the left, two strokes on the right. Wear time is quite remarkable, too. I was able to wear this for a good 14 hours without budging. It doesn't smudge, doesn't fade, resistant to sweat and water, but can be removed easily with a makeup remover. - Precise felt tip applicator lets you create both thin and thick lines. - Fast drying, long wearing formula. - I've read somewhere that the product dries out quite quickly despite keeping it tightly-capped. before it actually dries out on me, haha! Sleek MakeUp Flick It Eyeliner, Fairy Drops Volume Burst Mascara. 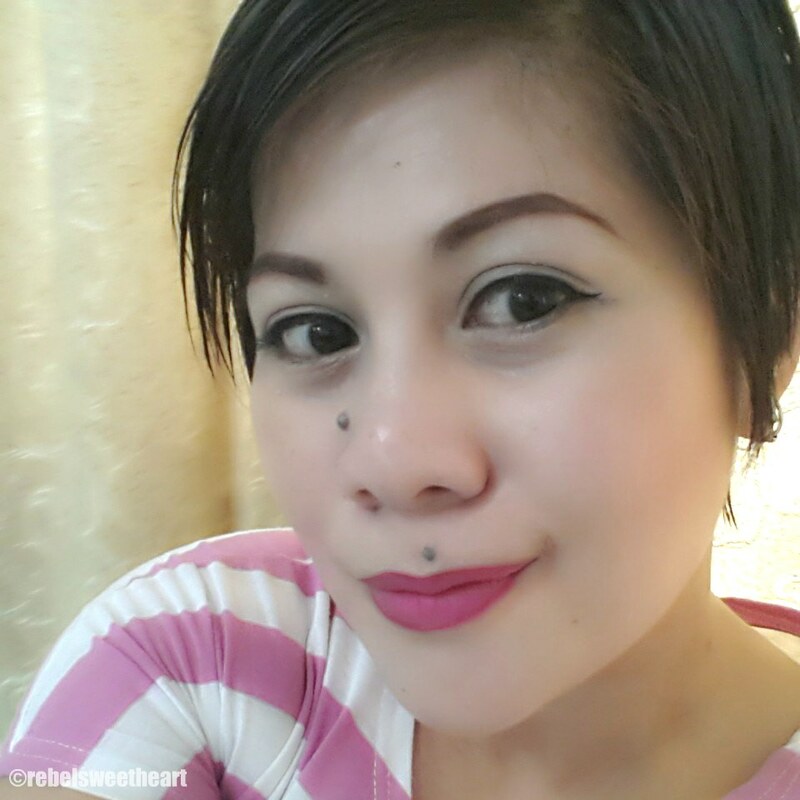 CHEEKS: Sleek MakeUp Blush in Pomegranate. Sleek MakeUp Flick It Eyeliner sells for Php 475 each (a little over $10) and is available online via Beauty Corner PH. You can also check out the Sleek MakeUp counters at The Ramp Crossings Shangri-la, The Ramp Crossings Quezon Avenue, and The Ramp Glorietta 3. Parang gradient yun shading ng eyeliner or is it just me? Seems the blackish blue fades to a lighter electric blue shade? I have used a pen type eyeliner before and actually prefer them. I will be checking this one out the next time I need eyeliner. That is so pretty! I hope you get to use it all too! I've never heard of Sleek Make Up. Love the packaging, though! It looks well marketed. Thanks for sharing! That color does suit you well, and it's a nice dark blue (which I love!). You've done a great job with the application too. Thank you for sharing the product. The kind of eyeliner I am looking for! I find the tip pen a lot easier for make-up beginners like me. I am running out of my H&M di liner so will check on this. btw, you have such an amazing skin, dear. Wow that looks like great eyeliner! love the pics! I struggle with eyeliner! this looks like a good one for me to try! thanks so much for sharing! I am just terrible at applying makeup. I only do it for special events. This looks like it could be fun. I always wanted to try the cat eye look. I'm using a pen type eyeliner from Browlash. But I still need more steady hands.